Rain, we’re finally getting tons of it here! Along with strong, crazy winds yesterday which the dogs were not thrilled about for their backyard trips. I’ve got to get them out for a long walk and myself out for a long run before it starts again today! This week has been draining and I did not get a chance to do a huge grocery run, so my eats started out very well with large, fresh salads. Butternut squash, broccoli, and tofu oil free stir fry. 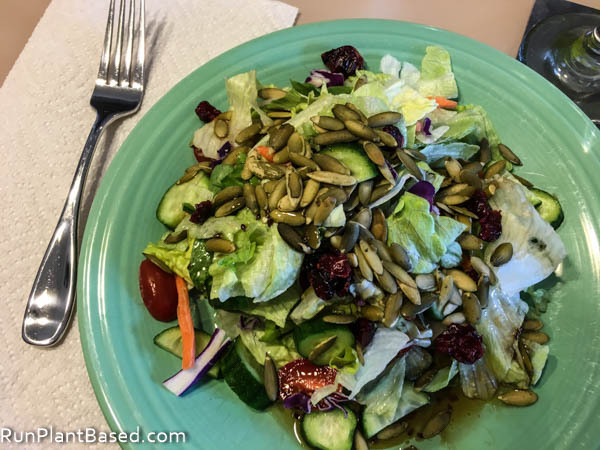 Huge salad with pumpkin seeds. 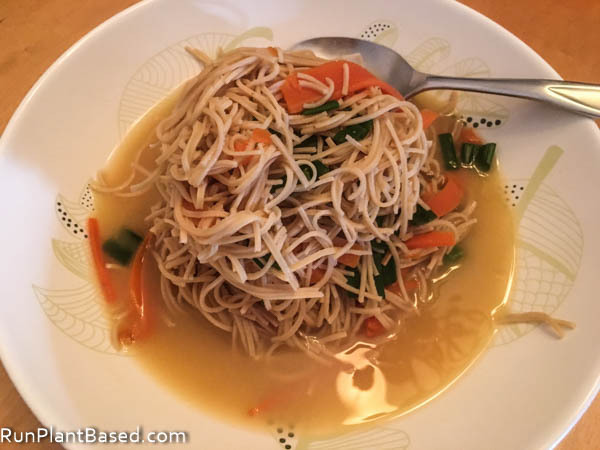 Then started getting interesting as I was running out of fresh ingredients like this miso soup with high protein Explore Asian Soybean Spaghetti. The soybean spaghetti makes a good pantry staple when you need something fast and hearty. 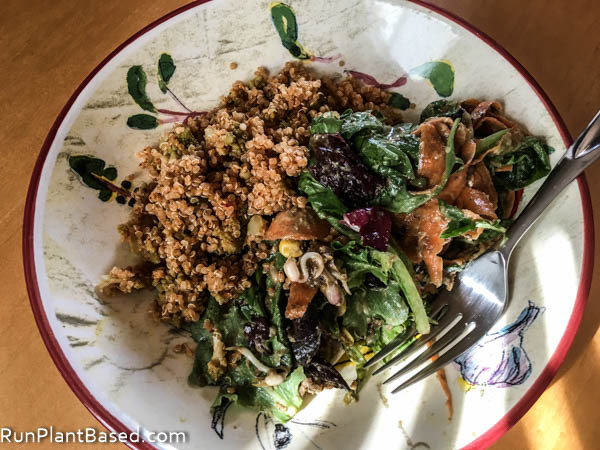 And this interesting blend of leftover salad and leftover spicy curry quinoa. 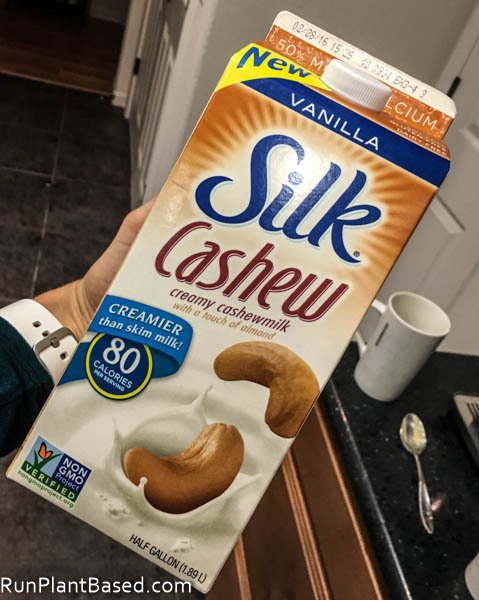 I have been enjoying great coffee thanks to this Grocery Outlet find – Silk Vanilla Cashew Milk. It’s very creamy and sweet by itself and perfect for coffee. 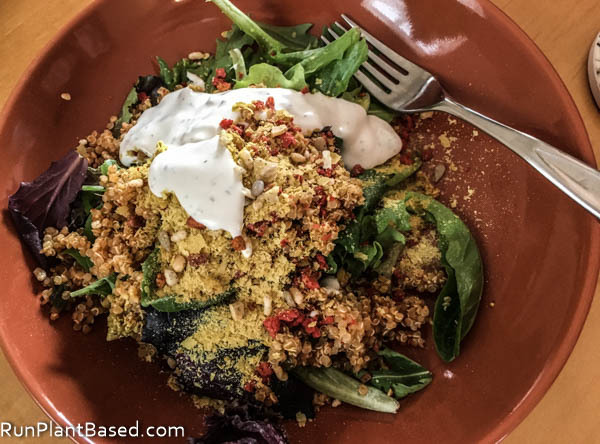 By Friday I needed to use up some fresh greens and layered them with more leftover quinoa, sunflower seeds, vegan bacon bits, nutritional yeast, and Follow Your Heart Vegan Bleu Cheese Dressing. 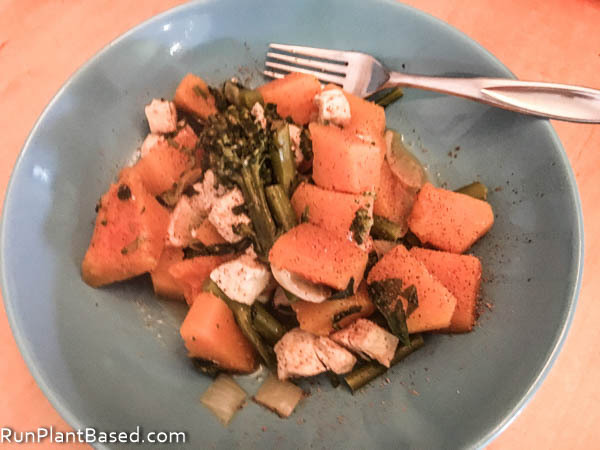 It was a total comfort salad, but tasty! Friday night we headed to a new Indian restaurant that is still working the kinks out. I checked their website and confirmed they had a huge vegan and vegetarian menu, served beer, and were an buffet during lunch hours and sit down restaurant for dinner. And very highly rated so far. But when we got there, we found they’re a buffet for dinner now too and not serving beer yet because they’re waiting for a liquor license. 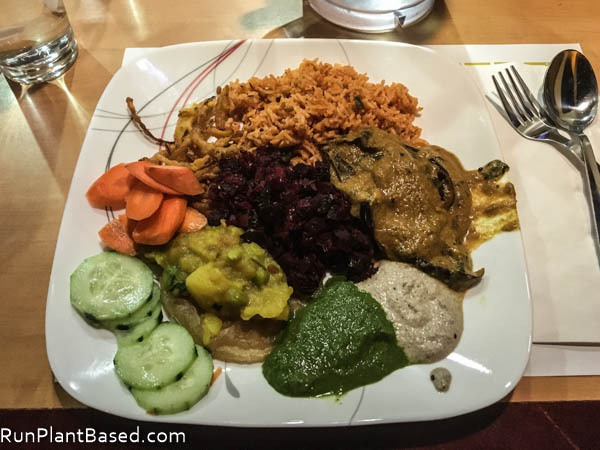 Oh well, the buffet still had plenty of vegan options and I made an interesting looking plate with a spicy tomato rice, cooked beats, a spicy eggplant dish, spicy potato dish, veggies and sauces. It was good, but not as healthy as I thought it would be with a lot of fried carbs and greasy options. 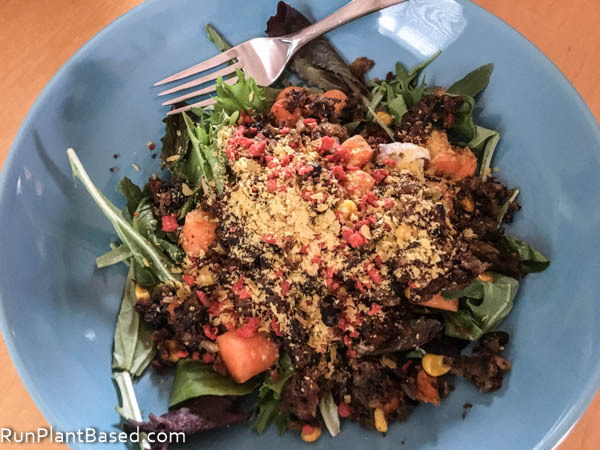 For a post gym lunch yesterday, I used up the last bit of fresh greens and carrots for a simple salad topped with a veggie burger, vegan bacon bits, and more nutritional yeast which was delicious. 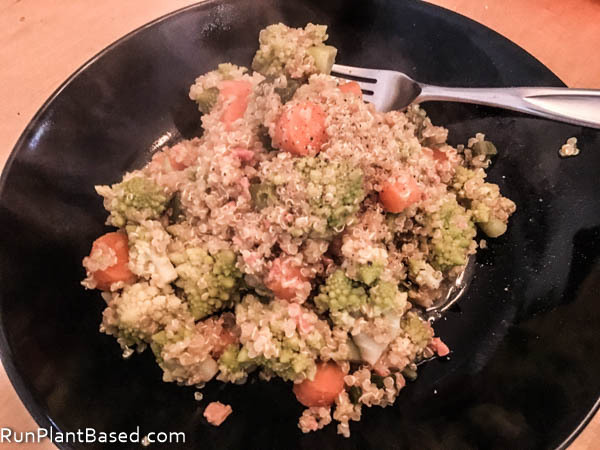 And a simple quinoa dish for dinner seasoned with miso paste, curry powder, and garlic powder. I must get shopping today for fresh stuff! But first my final long training run before a half marathon next weekend! I cut last week’s long run at 8 miles because I was feeling exhausted after a busy week and an intense 12 mile run the weekend before, my legs were feeling done. I could have pushed it, but feared I’d be risking an injury if I did and I’m gonna play it by ear today on how long the run is – maybe somewhere between 8 to 11 miles. We’ll see. But first the list! Exciting new vegan options coming from Hampton Creek! 4 simple vegan breakfast options. 6 ways to avoid stress. A health scare leads this family to a new way of eating. And this inspirational teacher changed his lifestyle after health scares. This women turned her health around on a plant-based diet. 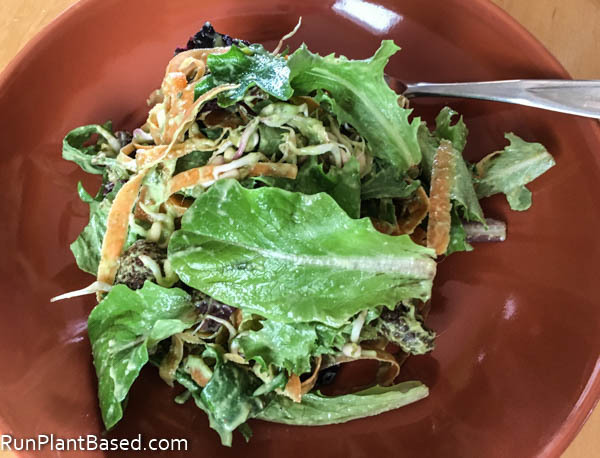 Survivors thrive on plant-based diets. Pamela Anderson gets edgy with this limited edition shirt. 21 beautiful vegan dessert recipes. Blending faith and fitness is an interesting concept. And this teacher is encouraging empathy and compassion in students. Finally, Dr. Greger takes and interesting look at calories and type 2 diabetes. I love cashew milk! It’s my favorite non-dairy milk. I think it’s my favorite now too! What was the name of the Indian restaurant? Great rainy day eats! Wish I had been prepared as well. I ended up getting sick over the weekend, so I was completely overwhelmed by the weather on top of it. I could still go for your comforting grain salads now, anyway. Thanks and just wow on the rain! So sorry about being sick, that’s not fun and I hear ya on craving healthy foods after that. I can’t wait to try the Hampton Creek ranch dressing. That’s a great article on empathy education. I love how the schools are letting her do her program there. Agreed, I’m excited about a lot of Hampton Creek’s products! And true on education, I was thinking how I could come up with the resources to start a program like that. 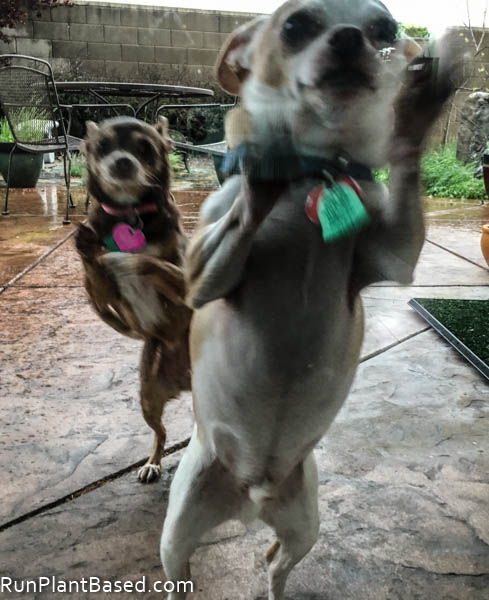 Oh no, they hate the rain! Miko especially, he refuses to leave the overhang! Wondering how she will do in high winds and rain…should find out soon! Thank goodness it was a lighter winter! We’re getting tons of wind and rain this weekend for out half marathon, ugh!